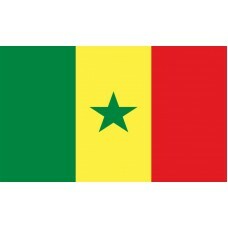 The Flag of Senegal features three vertical bands in the colors of green, yellow, and red. There is a 5-pointed green star in the middle of the yellow band. The Senegal flag was adopted in 1960, when it gained independence from France. 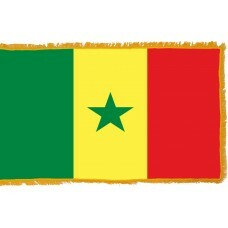 There are many interpretations of the Senegal flag and what it represents. The green color represents the country's main religion, which is Islam. It is thought that green was the favorite color of the prophet, Mohammad. The green color also represents hope. 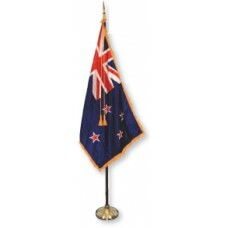 The yellow color is a symbol of the country's wealth and represents the "product of work." Yellow is also "the color of arts, literature and intellect." The majority of the literature teachers in Senegal, wear yellow blouses. The red color is the "color of blood" and the nation's determination to fight and make sacrifices. The star is a symbol that is used on a lot of the African flags and represents light, knowledge, and perfection. As well as green, yellow, and red being the Pan-African colors, the three colors also represent the three political parties which joined to form the "Union Progressiste Senegalaise." The green was the "Bloc Democratique Senegalais" (Senegalese Democratic Bloc), the yellow was the "Mouvement Populaire Senegalais" (Senegalese Popular Movements), and the red was for the "Parti Senegalais d'Action Sociale" (Senegalese Party of Socialist Action). Senegal is a country in West Africa that shares borders with Mauritania, Mali, Guinea, Guinea-Bissau, and The Gambia. The capital city and largest city of Senegal is called Dakar. Dakar is home to "Place de L'Obelisque" which is considered to be the center of the country and the place where all the important moments during Senegal's history passed. It is thought that Senegal obtained its name after the Portuguese arrived during the 16th Century. When they arrived, the native fishermen were shouting "Sunu Gaal," which translates as "these are our boats" and as the Portuguese did not understand what they were saying, they started referring to the country as "Senegal." Following the arrival of the Portuguese, other Europeans were arriving to the country and in 1677, France gained control of the "Island of Goree" and it was mainly used as a base for slavery and the purchase of slaves until it became the largest slave-trading center. Today, just from the architecture still seen on the island, one is able to differentiate between the slave-quarters and the grand houses of the slave traders. While Senegal was under French rule, it was forbidden from having its own flag as the French feared that Senegal would try to gain independence if they did this. Following the "Decolonization movement in Africa" Senegal became a self-governing republic still in the French community. On April 4th, 1959, Senegal was merged with the French Soudan and the Mali Federation was formed. The Mali Federation gained independence from France on June 20th, 1960. 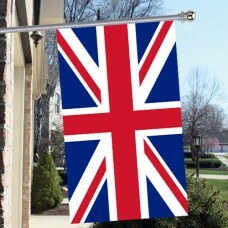 When they gained independence, the same tricolor bands were used on the flag, but instead of the star in the middle, there was a "Kanaga" (a depiction of a human). On August 20th, 1960 just two months after the Federation gained independence, Senegal gained independence from Mali and the Kanaga used on the previous flag was changed to a star. Join sea and springs, join steppe and forest! We say it clearly -- the sword has no flaw. But a people turned to all the winds of the earth. We will be hard without hatred, with two open arms. The Bantu is a brother, and so is the Arab and the White. Young and old, men and women. Death, yes! We say death, but not shame.